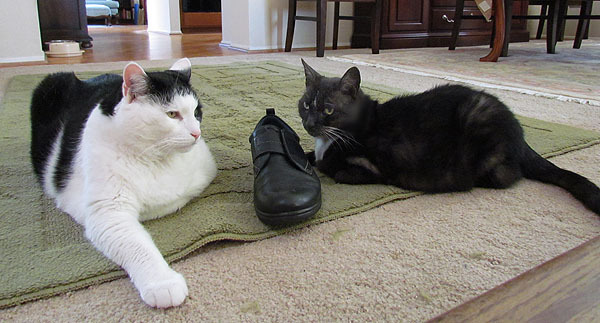 Today you get both cats in one picture, drawn together by the ever-so-seductive aroma of a freshly removed shoe. There’s just something magical about it that they can’t resist. And now the news: today is your last glimpse of Inkblot and Domino for the next three weeks. Try not to let the weeping and wailing get out of hand. In a few days I’m off on vacation, and while I do plan to continue catblogging while I’m gone, there’s no guarantee of success. It depends on (a) finding foreign cats, and (b) prodding my iPad to successfully upload my pictures to the Mother Jones servers. But I’ll do my best. UPDATE: And here’s a travel question for the hivemind. Wells Fargo has just informed me that my debit card won’t work in Europe unless I switch my current 6-digit PIN to a 4-digit PIN. That’s no big deal, but I still want to know if this is true. I’m aware that antiquated American-style cards sometimes don’t work at all in European machines, which require smart cards, but if they do work, do they require 4-digit PINs? Anyone have recent experiences they can share?